Background: Polyhydroxyalkanoates (PHAs) are a natural origin biodegradable polyesters consisted of various 3- and 4-hydroxyacid derived repeating units produced by microorganisms as energy storage. PHAs have been intensively studied due to their biodegradability and biocompatibility enabling their use both in packaging and agriculture as well as in medicine and pharmacy. PHAs obtained via biotechnological routes can possess various functional groups in their side chains. However, the diversity in their functionality is limited due to issues of conservation of functional groups during the polymer formation. Objective: The review focuses on recent progress in the area of synthesis of PHAs functionalized with various reactive as well as bioactive end and side groups. Conclusion: A potent route to resolve the problem of functional group diversity in natural origin PHAs involves post-polymerization modification, where the desired side groups can be created. On the contrary, synthetically produced PHA analogs obtained directly via ring-opening polymerization of β-lactones offer various functionalities at different position throughout the polymer chain. 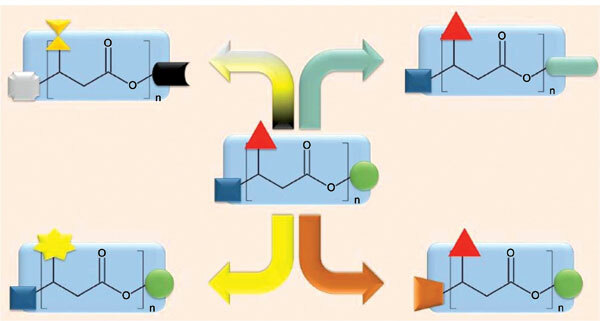 The desired α- and ω-end groups can be introduced into the polymer chain using specific polymerization, initiation or termination strategies, respectively. The preferred side chain functionality is obtained by choosing the appropriate β-lactone monomers bearing respective functional groups. All functional groups may also be subjected to additional chemical modification. The degradation of PHA as a method for producing functional polymers as well as their possible further applications are also discussed. Polyesters, polyhydroxyalkanoates, poly(3-hydroxybutyrate), functional polymer, ring-opening polymerization, side-chain functionalization, reactive end groups.